Thanks to a generous grant from MathWorks, a team of Weldon faculty members is launching a new online course in the nanoHUB-U style, or nanoHUB course for short, this fall. The online course is broadly accessible to students who have research interests and career goals in biomedicine, healthcare, and life sciences disciplines. 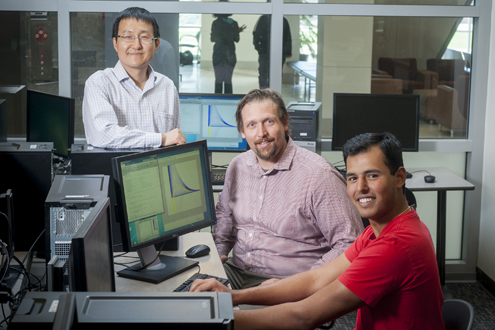 Nan Kong, associate professor of biomedical engineering, David Umulis, associate professor of biomedical engineering and agricultural and biological engineering, and undergraduate student Sean Thandupurkal. "This course gives us a unique opportunity to demonstrate the quality and innovation of Weldon School curricula and research to thousands of students worldwide who are interested in a biomedicine-focused STEM education, but who may not have the privilege to physically enroll in a world-class university like Purdue,” said Nan Kong, an associate professor of biomedical engineering at the Weldon School. Kong is developing the course with David Umulis, an associate professor of biomedical engineering and agricultural and biological engineering at Purdue. The course, entitled “Computational Modeling in Biology, Medicine, and Healthcare,” is a problem-solving based course that will enhance students’ training in computational modeling and analysis related to engineering tasks and model-based reasoning. Three teaching modules will emphasize statistical data analysis, model calibration, and system optimization and their application in biomedical and healthcare engineering problems. A final module will use all the three building blocks to solve an open-ended project. The course will cover critical biomedical and healthcare engineering topics, including biotransport and signaling, cancer progression, and infectious disease transmission. The nanoHUB course will give rise to a new undergraduate course offered at Purdue’s residential campus with lectures that frame the streamlined teaching modules from the nanoHUB course. The course is expected to be offered in spring 2015 and will provide residential students with an additional opportunity to gain experience in mathematical modeling of complex processes and systems in biology, medicine, and healthcare than what is currently offered on campus. Several peer institutions, both domestically and abroad, are expected to collaborate with the project team in adopting the nanoHUB course developed at the Weldon School for their own universities. This is the first nanoHUB course offered by Weldon School faculty members that was funded by MathWorks, the leading developer of mathematical computing software for engineers and scientists.